Prevent fraud. Maximize prices. Reduce risk. 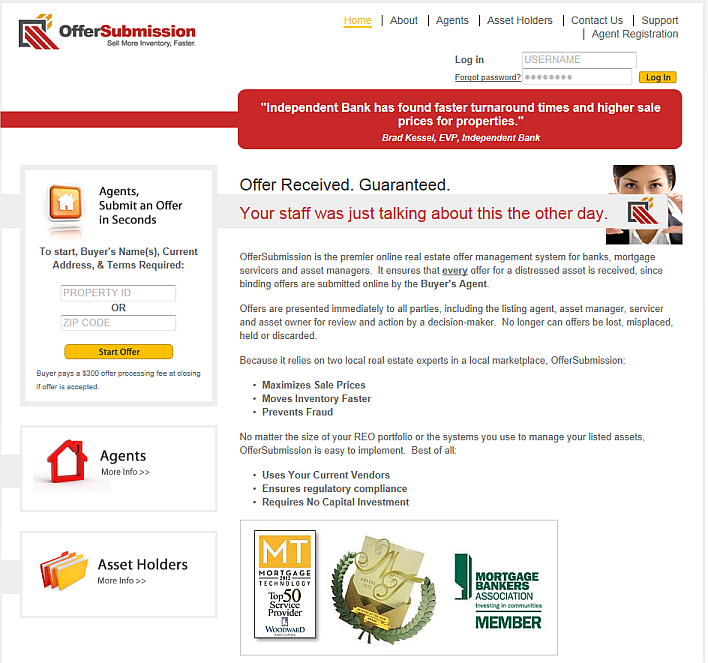 OfferSubmission is the premier sales management and offer negotiation platform for banks, non-bank mortgage servicers, asset managers and large real estate investors. It provides 360° insight into the marketability of a real estate asset by giving buyer’s agents a voice for the very first time. The platform delivers their offer directly to the seller where it is decisioned according to each customer’s own business rules. The transparency and real-time environment provide an iron-clad audit trail that reduces risk and quickly identifies agents with hidden agendas, as well as property issues that could be detrimental to the value or well-being of the asset. Just as important, it clarifies a property’s true market value with the most accurate valuation tool of all: bona fide offers from real buyers in the market right now. OfferSubmission is built with flexibility so it can be used as a standalone system by small banks or function as a dedicated sales negotiation portal in tandem with virtually any enterprise servicing or asset management software. Prevents Fraud For the first time, buyer’s agents are given an active role in the REO negotiation process, ensuring that every offer is presented for review. No longer can offers be lost, prioritized or discarded which means more offers for every asset. Maximizes Sale Prices More offers means more competition, which ultimately drives sale prices higher. OfferSubmission ensures every asset sells for True Market Value. Improves Transparency Every stakeholder in the REO sale including investor, servicer, asset manager, listing agent and buyer’s agent is engaged and accountable, with automated notifications and reminders to make sure that the expectations are met and issues are quickly resolved. Ensures Compliance Regulatory requirements and service-level agreements are easily adhered to via a robust rules engine designed to ensure compliance with automated reminders, easily updated disclosures and iron-clad audit histories. Completely customizable to follow your business processes. Reduces Risk Every action and decision is captured in real-time, every prescribed rule is followed and every required document is stored according to seller expectations. Defend every decision and eliminate finger-pointing. Increases Originations Automatically capture every possible lending opportunity via real-time sharing of buyer information with portfolio retention or originations departments. Generate profitable new loans and establish new banking relationships with every prospective purchaser, even cash buyers. Robust Reporting Customizable reports provide the data that you need to track efficiencies and results by portfolio, region, department, employee and outsourced third-party vendor. OfferSubmission is the one technology you can add to your arsenal that quickly improves the bottom line with tangible and measurable results. Schedule a demo today and speed the recovery.